Botanebi/”Botan” Prawn, or “Pandalus nipponesis” for the specialists, is a large prawn found in all seas of Japan at depths varying from 300 to 500 metres. They are caught at 200~300 metres depth in Suruga Bay and along the Western coast of Izu Peninsula In Shizuoka Prefecture. 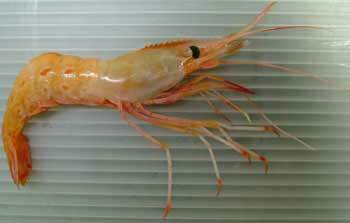 Once abundant, they have become scarce and only small specimens are found, whereas Hokkaido produces up to 20cm-long prawns. They are known under different names: “Toyamaebi and Kijiebi”. 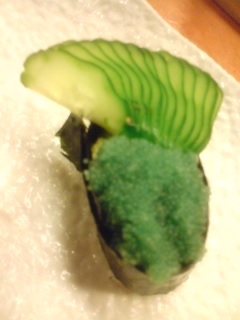 It is not a cheap morsel in Sushi bars. But it is interesting to note they are essentially eaten raw as like “Amaebi”. They become very sweet after some time in the refrigerator. Now, if you are lucky enough to find them fresh with their eggs, ask your chef to dress them as above, or even better, put the eggs on top of a “gunkan nigiri”! And one more thing, if they are fresh again, don’t forget to ask for the heads deep-fried!